Back in high school, the lunch room was divided by social status. If you were a football player, you sat at one table. If you were a nerd, you sat as far away from that table as possible. That’s why movies like “She’s All That” became cult classics. It’s awesome to think that someone can pluck you from your uncoolness and quickly teach you all you need to know about fitting in. Sometimes, in our adult lives, we find ourselves at a figurative table, looking longingly toward the “cool kids’ table”. Maybe you’re sitting at the don’t-know-how-to-manage-my-money table, looking over at the cool investor’s table. Never fear! Welcome to the Everything Finance version of “She’s All That”. 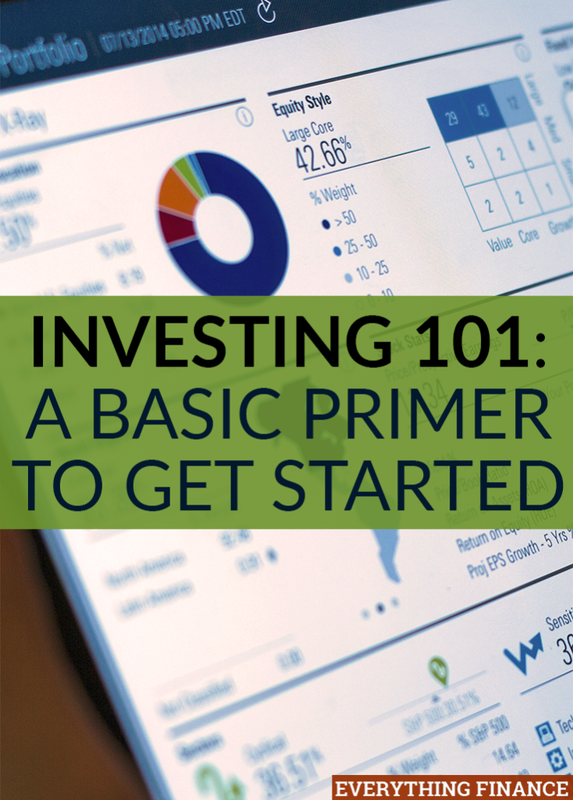 Today, you’ll learn the very basics of investing, helping you talk the lingo at the next cocktail party or dinner with the in-laws. You won’t leave here today knowing everything there is to know about investing, but you’ll be a leg up on half the US population (around 52% of the US doesn’t invest in the stock market). Let’s start with the most basic question – who should invest? That’s an easy one, because everyone needs to invest. If you ever plan to retire, you’ll need to do more than save your paycheck in a savings account. Your money simply won’t grow enough to keep up with inflation that way, and you’ll need to save far more than you spend. That’s a tall order. Investing helps your money work for you, and the stock market allows you to earn more interest than you can anywhere else. Have Disposable Income – Don’t forgo paying bills so you can invest, thinking the stock market is some sort of lottery or blackjack table. If you have debt, many experts will recommend that you forgo investing in all but your company’s 401(k) until you’re debt-free. The rationale is that your employer offers a 401(k) match, so by not investing, you’re leaving money on the table. Of course, you can do both – pay off debt and invest in the stock market – if you have the funds. Have An Emergency Fund – If you’re constantly worried that your car will break down or that you’ll have a major medical expense, you won’t invest wisely. You’ll be far too cautious to see a good return on your investments. Build a budget, save up an emergency fund of 3-6 months of expenses, and then start investing. The easiest place to begin investing is with your company’s retirement program, if they have one. If you’re self-employed, check out this article on how to save for your retirement. Once you become comfortable with the strategy, you can branch out to a brokerage firm, who will assist you with additional investments. Before investing, you need to understand far more than this article can teach you. You have to start somewhere though, so let’s begin by covering basic investment terms. When you buy a stock, you’re buying ownership in a company. Granted, unless you buy a lot of a company’s stock, you probably own a very tiny fraction of the company. Nevertheless, you’re an owner – and owners reap the benefits of a company’s growth. Stocks are valued based on the company and prices change frequently. If you only have $500 to invest, you might be able to buy one share in a very established company, or you might be able to get 250 shares in various smaller companies. When a company needs to raise money, they might decide to offer bonds. Bonds are basically a loan you make to the company or government. At the end of the bond period, the company or government will pay you back your money in full. At set intervals along the way, they will pay you dividends. No investments are risk free, but bonds are generally considered to be a safe investment. The safest bond investment is a US Treasury bond, which is backed by the US government. Because of the stability of this type of investment, the rate of return is much less than other riskier investments. Commodities are often associated with the agricultural field, though they aren’t limited to it. Commodities are investments that can be made whereby any producer gets paid essentially the same amount. Also, commodities are often inputs to other industries. So, back to agriculture: Farmer A’s cotton isn’t likely to be deemed significantly better than Farmer B’s cotton. Therefore, they’ll be paid essentially the same price for their cotton. Both Farmer A and Farmer B might supply cotton to a certain textile company. Sometimes money is a commodity. That means it’s possible to invest your money in money – that type of investment is called a money market. Money market accounts make money by participating in borrowing and lending over the short-term in things like certificates of deposits (CDs), US Treasury Bills, and municipal notes. Mutual funds are investment funds that pool together money from investors in order to purchase securities. The funds are professionally managed and provide documentation on their performance to the public. A mutual fund might consist of money market, bonds, stocks, or a combination of investments. In order to make money at stocks, you need to find stocks that are undervalued, which is outside the scope of this article. But you don’t make much money by buying an expensive stock that grows at 3% a year. What if you bought several cheaper stocks that had the potential for more extreme growth – like 10% – for a few years? After a few years, you sell those stocks before they plateau (or worse, take a downturn). You then reinvest your profits into similar undervalued stocks. By reinvesting the profits you make, your money compounds, growing at an exponential rate. On the other hand, if you only buy the one expensive stock and hang on to it year after year, your money isn’t growing much at all. Investing requires research – no matter the types of investments you make. You want to research and compare brokerage firms, looking for good standing, fair rates, and performance. You also want to look at the way a mutual fund is managed and its past performance. You can only do so much research on companies, but you should still look into the companies you’re interested in investing in. It’s not the only company you should investigate – you want to look at competitors. If you don’t know the slightest thing about biotech, it will be harder for you to understand what factors affect a biotech company’s stock. The evening news might be filled with a goldmine of information for the biotech field buried inside political, war, and environmental stories. You won’t catch onto any of it because of your lack of knowledge, and that means you can’t make informed investment decisions. However, the biotech pro is tuned in, buying stocks that are likely to weather the problems and selling the ones that are dangerously impacted by the news. For goodness sake, don’t panic when the stock market drops, selling off all your stocks. History proves that the stock market will recover – though it might take some time. Sit tight and you might be rewarded for your patience. While most people think “stocks” when they think “investing”, as we covered in the terminology section, there are plenty of other ways to invest. It’s a good idea to spread your money out, because different types of investments have different levels of risk. We already mentioned that bonds are a generally safe investment. However, investing only in bonds means you won’t see as good of a return as you might possibly see with stocks. On the other hand, if you invest unwisely, you might put all your money into stocks that will fail. That’s why it’s smart to diversify as you’re spreading out the risk. If you’re younger, you can withstand more risk in your portfolio than if you’re 5 years away from planned retirement. Therefore, diversity will depend upon the markets, your age, your risk appetite, and other factors. When the stock market falls, instead of selling off your stocks like the other panicked people on Facebook, maybe you should take a deep breath and buy stocks. After all, some of them will be at a new, low price. And when Uncle Danny tells you about a great investment over turkey and sweet potatoes this Thanksgiving, don’t whip out your checkbook right there. The money you invest is yours. The money that you could lose is yours. Don’t be overly influenced by others. As we covered before, do your research, invest for the long haul, and let others do the same. Investing is a risky business – that’s how money is made. However, by educating yourself and continuing to research and learn, you’ll find that investing isn’t all that scary. It’s only scary because you’re not familiar with it. Afterward, maybe you can invite someone over to join you at the cool investor’s table! When you first started investing, what was the hardest concept to understand? Have you delayed investing? Why? Do you participate in a 401(k) plan?